Butterfly weed is one of those plants that is an absolute "must" if you are trying to attract butterflies and other beneficial insects to your garden. Botanically known as Asclepias tuberosa, it has a few common names: butterfly weed, Indian paintbrush, orange milkweed, pleurisy root, and yellow milkweed. And don't let the name throw you—butterfly weed isn't just going to attract butterflies to your garden. Other beneficial insects, such as lady beetles and bees, also are attracted to butterfly weed. And you just might be lucky enough to spot a hummingbird hovering around your plants, as well. Butterfly weed is native to the prairies of the Midwestern United States. It has flat clusters of bright orange blossoms and blooms from early summer to first frost in most areas. It is about one to two feet tall, with glossy, lanceolate leaves that are arranged spirally up the length of the stem. The seed pods turn brown over time and are nice for adding winter interest to the garden. Be forewarned, however, that you will likely end up with butterfly weed sprouting all over your garden. For some of us, this is a good thing! 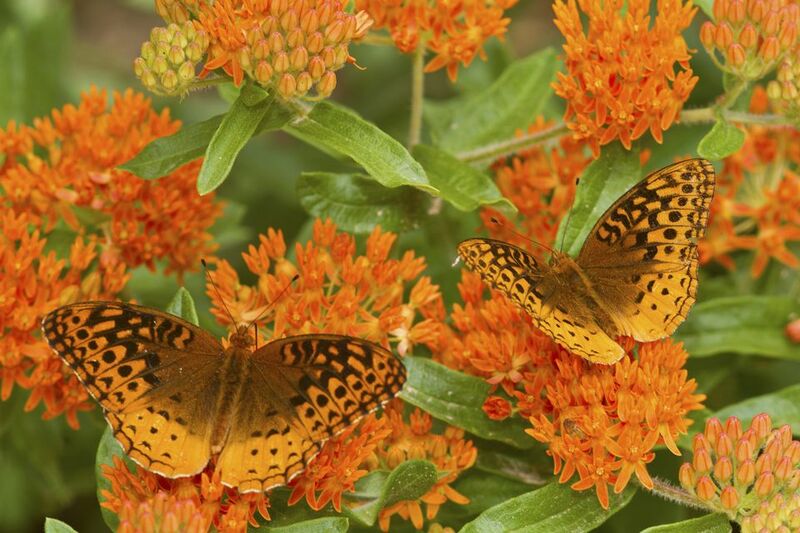 If you'd like to keep butterfly weed in check, simply cut off the seed pods before they open. If you break a leaf or stem of common milkweed, a milky white sap will ooze out. This substance, which is the reason for the name "milkweed," can be irritating to the bare skin. Though butterfly weed is often called "orange milkweed," and is in the same family as common milkweed, it doesn't have this milky sap. As a native plant, butterfly weed is well-adapted to less-than-ideal conditions. It grows well in clay soil, in dry or rocky soil, or even in drought conditions. It does best in full sun but will withstand some shade as well. Butterfly weed is hardy in USDA zones three through nine. Butterfly weed can be grown from seeds you sow directly in the garden (this is best done in fall, and they'll sprout in the spring) or started indoors during the winter after a period of cold stratification -- though it's worth noting that butterfly weed really dislikes having its roots disrupted, so direct sowing is probably the most reliable method or propagation. It can also be purchased at most nurseries or via mail order. Keep butterfly weed well-watered through its first season; after that, it will be fine pretty much left on its own. Butterfly weed doesn't require fertilization. A topdressing of compost or composted manure once per year around the plant is sufficient. Butterfly weed really doesn't have many pests or disease issues. Aphids can sometimes be a problem; a blast of water from the hose is usually enough to get rid of them. Also, if you grow butterfly weed in a very wet location, root and crown rot can be a problem. Butterfly weed is also known as "pleurisy root" because Native Americans used to chew the roots as a remedy for pleurisy and other pulmonary issues. The root was also commonly brewed into a tea to treat diarrhea and other stomach problems. Butterfly weed is a host plant for the monarch, queens, and grey hairstreak butterflies.